Real estate agents have to wear a lot of different hats when helping clients sell a home — interior decorator, market analyst, maybe even therapist. You might have to wear the contractor or accountant hat when a seller decides to put their home on the market and tells you they’re planning some home improvement tasks to increase the resale value. According to Zillow Group CEO Spencer Rascoff and Chief Economist Stan Humphries in “Zillow Talk: The New Rules of Real Estate,” not all remodels give the same return on investment (ROI) when it comes time to sell. Here’s the inside scoop on remodel projects that can affect a home’s value. Spending more for an upscale renovation isn’t necessarily a better investment than spending less for a mid-range renovation. For example, on average, a mid-range bathroom remodel — replacing the toilet and light fixtures, adding a second sink and putting up some wallpaper — results in a $1.71 return for every $1.00 your homeowner spent on the project. But doing an upscale bathroom remodel that includes jet massage showerheads and gold-plated washcloth cubbies results in a return of just $0.87 for every dollar spent. The pattern of mid-range remodels giving a higher return than upscale remodels proves true for window and kitchen renovations as well. Rascoff and Humphries attribute this to the law of “diminishing returns,” which has to do with function versus fashion. Installing new windows likely improves the functionality — keeping out the cold and reducing the heating bill — and livability of the home. But installing stained glass windows with cherry trim doesn’t make the windows work better; it just makes them look pretty. As a result, the fancy windows don’t significantly increase the value of the home. If your sellers think a kitchen remodel will add thousands to the home’s value, you’ll have to tell them to think again. Both mid-range and upscale renovations return only about half the cost of the project — $0.52 and $0.51, respectively — one of the lowest returns on the home improvements that Zillow analyzed. If homeowners want to redo their kitchens, Rascoff and Humphries recommend they do it for the pleasure they’ll get when preparing meals, and not for the perceived value it might bring when the home goes on the market. 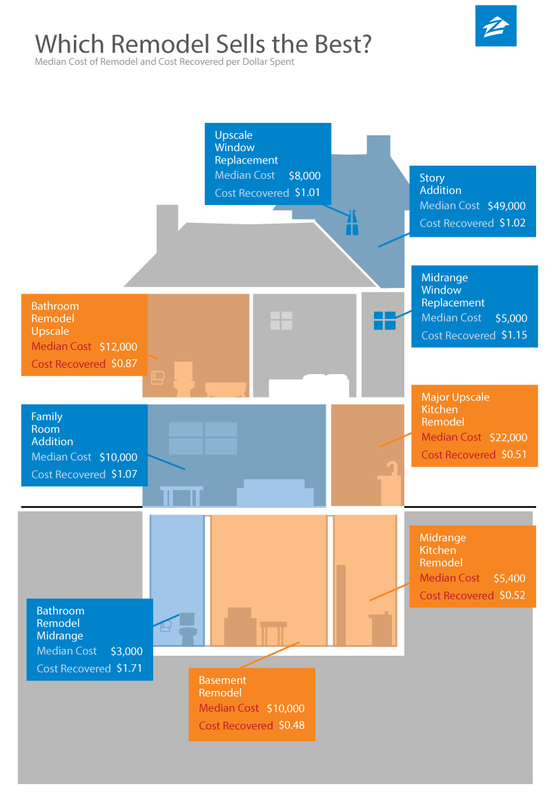 Even lower than a kitchen renovation are the returns on a basement remodel: $0.48. Add a story to the home however, and sellers will recoup about $1.02 for every dollar they spent. There’s no hard-and-fast rule that explains why; it could be that a new story is a visible component that increases the home’s usable space, while basements are unseen from the curb, arguably creepy and don’t add any new square footage. When sellers ask you which home improvement they should undertake to increase the value of their home, the hands-down answer is a mid-range bathroom remodel — and they should also know that results will vary as one person’s definition of “upscale” could mean “mid-range” to another. Whatever they choose, homeowners have many available options when they’re wondering about remodels. You can provide your own value when you help them determine whether a project will boost the home’s resale value or simply enhance their enjoyment of living there.